For courses in Math for Future Elementary Teachers. Mathematics for Future Elementary Teachers with Activities , 5 th Edition connects the foundations of teaching elementary math and the “why” behind procedures, formulas and reasoning so students gain a deeper understanding to bring into their own classrooms. Through her text, Beckmann teaches mathematical principles while addressing the realities of being a teacher. With in-class collaboration and activities, she challenges students to be actively engaged. An inquiry-based approach to this course allows future teachers to learn through exploration and group work, leading to a deeper understanding of mathematics. 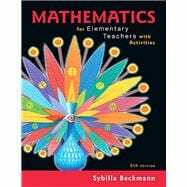 Known for her contributions in math education, Beckmann writes the leading text for the inquiry approach; in Mathematics for Elementary Teachers with Activities , students engage, explore, discuss, and ultimately reach a true understanding of mathematics. Beckmann’s text covers the Common Core State Standards for Mathematics (CCSSM) now implemented in most states. However, states not following Common Core will not find the information intrusive in the text. MyLab™ Math is an online homework, tutorial, and assessment program designed to work with this text to engage students and improve results. The Skills Review MyLab Math provides review and skill development that complements the text, helping students brush-up on skills needed to be successful in class. The MyLab Math course doesn’t mirror the problems from the text, but instead covers basic skills needed prior to class, eliminating the need to spend valuable class time re-teaching basics that students should already know. This enables students to have a richer experience in the classroom while working through the book activities and problems. In addition to basic skills review, the MyLab Math course includes a wealth of resources to help students visualize the concepts and understand how they come into play in an elementary classroom. These includes IMAP videos, Responding to Students Videos, eManipulatives, and brand new Common Core videos, Demonstration videos, and GeoGebra animations. Sybilla Beckmann is the Josiah Meigs Distinguished Teaching Professor of Mathematics at the University of Georgia. She received her PhD in mathematics from the University of Pennsylvania and taught at Yale University as a J. W. Gibbs Instructor of Mathematics. Her early research was on Arithmetic Geometry, but her current research is in mathematical cognition, education of teachers and mathematics content for students at all levels, but especially for PreK through the middle grades. She has developed mathematics courses for prospective elementary and middle grades teachers at the University of Georgia and wrote this book for such courses. She is interested in helping college faculty learn to teach mathematics courses for elementary and middle grades teachers, and she works with graduate students and postdoctoral fellows toward that end. A member of the writing teams for the Common Core State Standards for Mathematics and for NCTM’s Curriculum Focal Points for Prekindergarten Through Grade 8 Mathematics, she has worked on the development of several state mathematics standards. She was a member of the Committee on Early Childhood Mathematics of the National Research Council and coauthor of its report Mathematics Learning in Early Childhood: Paths Toward Excellence and Equity. She has also been a member on a number of other national panels and committees working to improve mathematics education. Several years ago she taught an average 6th grade mathematics class every day at a local public school in order to better understand school mathematics teaching. Sybilla has won numerous awards including the Louise Hay Award for Contributions to Mathematics Education for the Association of Women in Mathematics and the Mary P. Dolciani Award from the Mathematical Association of America. Sybilla enjoys playing piano, singing, dancing, and traveling with her family. She and her husband, Will Kazez, live in Athens, Georgia. They look forward to visits from their two children who are now away working and in graduate school.